Need to show different content to your visitors depending on where they’re located? If so, you need a geotargeting plugin. And you’re in luck, because in this post I’m going to review GeoTargeting WP. 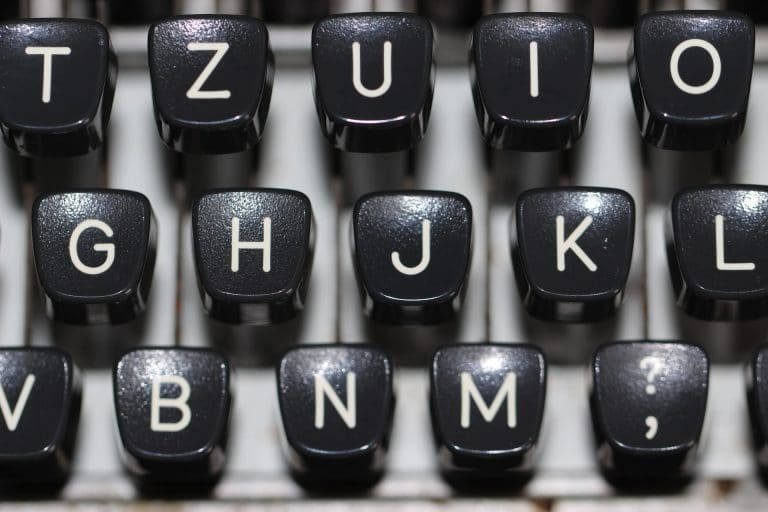 Geotargeting WP helps you geotarget your content via a variety of different methods. If you’re a developer, you can take advantage of all kinds of functions and hooks. But if you’re just a regular ‘ole WordPress user, you can geotarget with user-friendly shortcodes and easy human interfaces. Geotargeting WP can handle everything from country-wide geotargeting to specific cities. From playing around with it, I can say it’s pretty dang easy to use and works as intended. So join me to learn a little bit more about this WordPress geotargeting plugin. Auto detect real IP even if your visitors are using CloudFlare, Sucuri, Akamai, Ezoic, Reblaze, Varnish, etc. Additionally, they have a plugin on the way that will let you redirect users based on their location. So what’s different now from when Joe reviewed Geotargeting WP before? Now, the entire geolocation database sits in Timersys’ servers. So instead of installing a big bulky database on your own server or using a third-party system, now you just connect straight to the API at Timersys. I’ll talk more about the pricing at the end – but that’s a basic overview of how everything works. Alright, let’s get started. Once you install the plugin, you can head to GeoTargetingWP → Settings to configure it. Then, you can configure some basic settings. Cache Mode allows you to save a user’s location into PHP sessions as soon as the visitor comes. If you’re planning to use geotargeting on every single page, this can save you some API requests by caching the user’s location. But if you’re not planning to use geotargeting site wide, then you’ll actually eat up more requests because the plugin will cache every single user’s location, even if they don’t land on a page that uses geotargeting. Being able to turn this on or off is nice as it allows you to choose the mode which works best for your specific situation. Debug Mode isn’t really important unless you’re trying to, you know, debug something. And finally Fallback Country allows you to set a default country in case the plugin can’t detect a visitor’s location. And Bots Country allows you to treat all bots / crawlers as if they’re from a specific location. Scrolling down, you get the ability to create different Regions. Regions basically save you time by allowing you to group multiple countries or cities into one category. 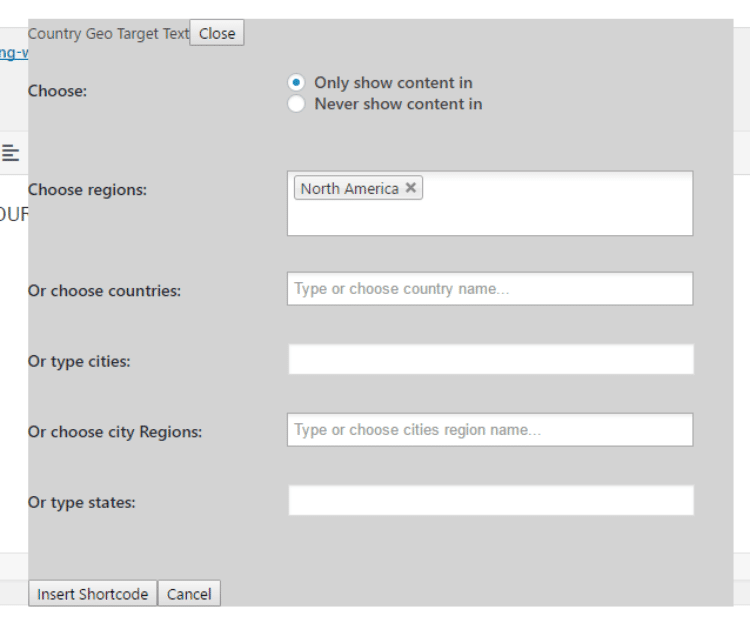 When you go to create shortcodes, later on, this allows you to quickly set up geotargeting. 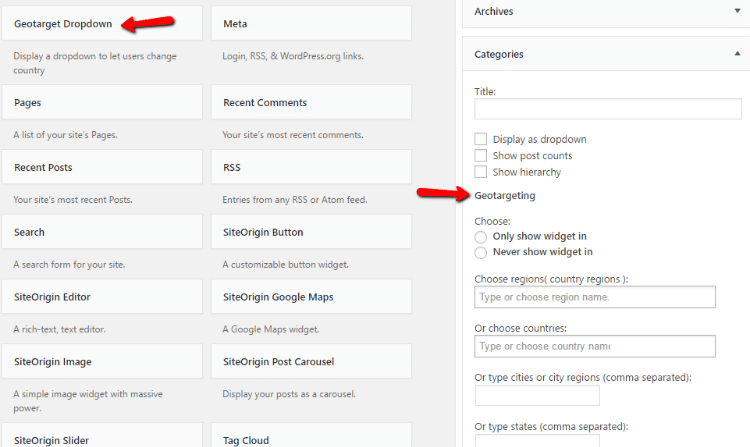 Alright, now that everything is set up, here’s how you can actually add geotargeting to your WordPress content. 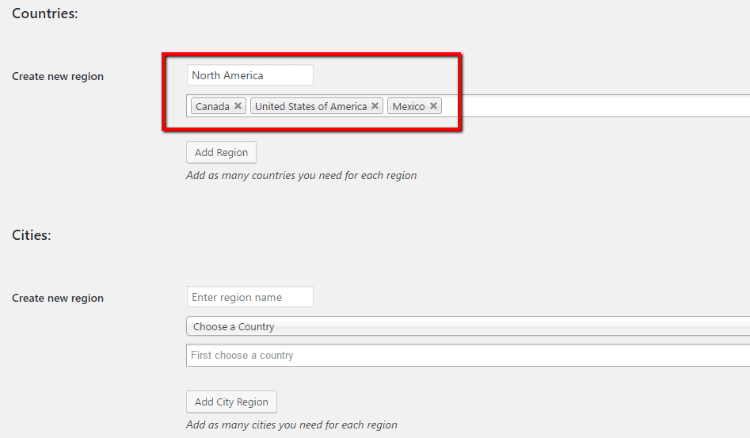 In the example above, you can see that I’m generating a shortcode for the North America region I created in the settings page. I’ll also generate a second shortcode for Vietnam so that I can test how well the plugin works in a second. 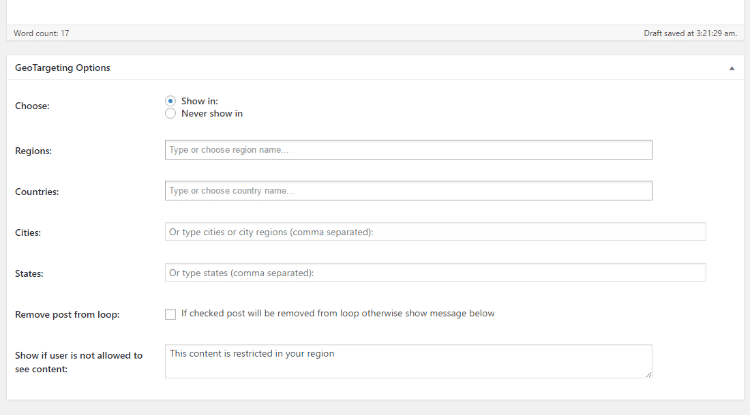 Note that you can choose to either Only show content in or Never show content in for the areas you select. You also get a new Geotarget Dropdown widget that allows people to change their location. If you’re a developer, the plugin also includes PHP functions to allow you to add geotargeting that way. They’re well documented, so you should have no problem getting up and running. Alright, let’s give things a test now. 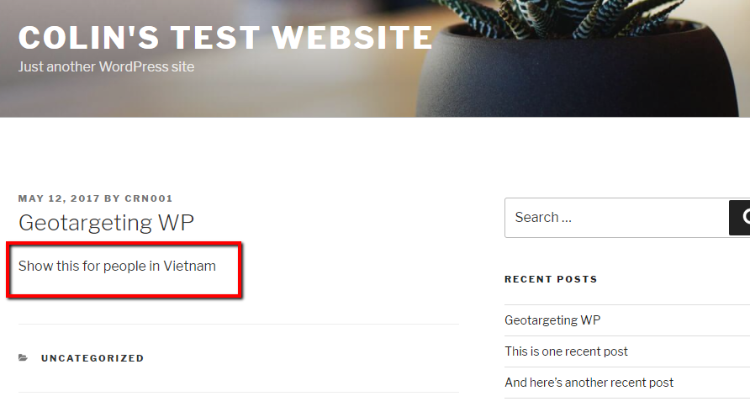 I live in Vietnam, so if I go to my test post, I should only see the content for Vietnam, not the content I created for North America. Success! While I can’t test every single country – the plugin worked perfectly when it came to detecting my location and showing me the proper content. Pricing – How Much Does it Cost to Use? Ok, the plugin is free…but API requests to the geotargeting database are not. So in order to use the plugin, you’ll need to purchase bundles of requests according to your usage. Remember – each time you need to get a user’s location, that’s 1 request. But if you use caching, you can ensure that you don’t waste multiple requests on the same user. So if your site gets 1,000 unique visits per month and you want to have site-wide geotargeting…you’d be looking at $5 per month to use the plugin. It’s important to note that Geotargeting WP EXCLUDES bot traffic from these calculations. So you only need to use requests on real, human visitors. And if you’re only using geotargeting on specific pages, you can get this number down because you won’t need to use API requests on every single visitor (just make sure to turn caching off in this situation). If you need to add geotargeting to your WordPress content, Geotargeting WP gives you a great deal of flexibility. You can target by both country and city. And between the shortcodes and other methods of targeting, you can work with geotargeted content in a number of ways. If those aren’t enough, you can always use the PHP functions for even more control. Once they roll out the redirection plugin, I think it will be a great full-suite way to geotarget pretty much every aspect of WordPress. And if you don’t need redirection, it’s great already.